Hi everyone! Its time for another class from OnlineCardClasses.com! 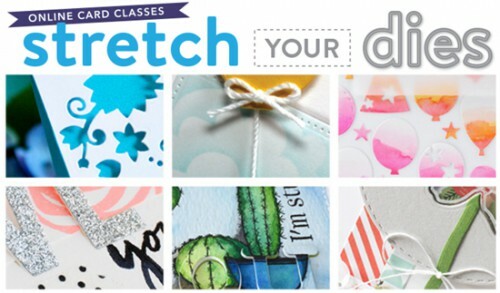 I’m once again thrilled to be a guest designer and contributor to the awesome Stretch Your Dies class. You know how much I love dies and I cannot wait for this one to start! So much to learn, so many new techniques to try! In the meantime I invite you to join a giveaway for your chance to win a free spot in the classroom! This class is all about discovering new, cool ways to use dies for card making. It’s based on the same concept as their popular Stretch Your Stamps class—each day the class will focus on a different kind of die, so it’ll be easy to find a die or two in your stash to follow along with. The class will have 20+ videos! For more information, visit Online Card Classes. Just leave a comment on this post by Saturday March 14th 23:59 (GMT +3) to be eligible. Winner will be announced in this post and also posted on the sidebar. Class starts on Monday, March 16, 2015. I can’t wait! And I hope to see you there! Diane, I’ve passed you e-mail address to onlinecardclasses, they will be in touch. Congratulations! Love the Online Card Classes, and so grateful for a chance to win! Always enjoy your videos, too Yana! I love die cutting so anything new is always welcome. I love die-cutting, so can’t wait to see what clever techniques come out of this class! This is my dream – to learn something from real professionals .. I really enjoy die cutting (a bit of an understatement 😉 ) And I would love to learn new ways to use my die cuts. Thanks Yana…. I would love to try an OCC class, and think this would be a perfect place to start. Thank you for the chance to win! This class really interests me since I have a total love for die cuts and would love to learn how to use them in more ways. This is an awesome opportunity to learn how to get more use from my dies! I’m a relatively new card maker, but I really enjoy it! I’m waiting for my new Big Shot Plus machine to come in (using a Cuttlebug for now), and can’t wait to take my creativity up a notch! Thanks for the chance to win! This class is just what I need to spark my creativity and i’m so glad you are a part of it. Thank you for this chance to win a spot in the class. I really enjoy your work and the way you inspire me with my cards. Thanks for the giveaway. Can’t wait for the class! Fingers crossed, these are the best card classes anywhere, and having new ways to use dies, that’s brilliant! Thanks Yana! I love these classes so here’s to hoping! Thanks for the chance!!! Thanks for a chance to win a spot in this class. Sounds like a fun time. I’ve enjoyed all of the online card classes and would love to win a spot in this class! Thanks for the opportunity! Thank you so much for a chance to win a class from alot of GREAT teachers. I would like to learn new ways to use my dies. Ooooo…so exciting. This class looks great! I love these classes and I can’t wait to see all your creative ideas! This would be a wonderful class! Thanks for the chance. This class sounds fabulous since I use die cuts on just about every card I make. Learning to use them in different ways would be awesome! Thanks for the chance to win. would love to be inspired to use some of my dies that have lost their magic! Can’t wait to see the new ideas! Thanks for the chance to win! this class sounds so fun! loved the watercolor class there! So very excited to attend this new online class! Thank you for the chance to win a free spot. wow, this is amazing!!! thanks for the opportunity to win! Would love to learn new ways to use the dies I have. Thanks for the chance to win a spot! Congrats on being a guest artist for this latest OCC, Yana! Having an obsession with my Big Shot, I would love to learn more ways to use dies in my stash. Thanks for the chance to win! Thanks for the chance to win a spot in this online card class. Love all Online Card Classes! The class sounds awesome, AND it starts on my birthday! I would be thrilled to win a spot! Love my dies and would love to get some new ideas and inspiration! Thanks so much for a chance to win and congratulations on joining the Altnew design team! I enjoyed your contributions to the OCC Stretch Your Stamps 2 and would love the chance to win a spot in this new die cutting class!